Since Pixar discovered that having songs sung over the top of the action by a pop star (well, Randy Newman in that instance) was perhaps more acceptable to modern audiences than having characters break into song as in traditional animated films, everyone else has realised what a good idea it is too. That, plus the commercial potential of a well known singer attached to a high profile film for higher album sales. Dreamworks have almost turned animated scoring into a way for aging rockers to bring out what I suppose could reasonably be called concept albums. 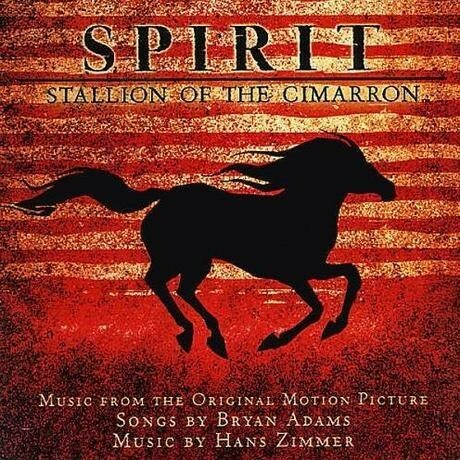 To add to the list of Phil Collins, Elton John and Sting, we now have Bryan Adams to lend his name to Spirit: Stallion of the Cimarron (and not cinnamon as you might have thought). In this case, the songs are perhaps more important since the lead characters are non-talking horses, thus they are required to add to the efforts of the animators in communicating the 'motivations' of the animals. I can't say I'm a big Bryan Adams fan, although his style of rock writing is a little more edgy than Sting or Elton John, that coupled with his croaky deliver do at least give the songs greater conviction, even if none of them stand out as exceptional. They range from the more ballad orientated and probable Oscar contender Here I Am to the more grungy and forceful You Can't Take Me. In one change to the efforts of the other artists mentioned, Adams has co-written most of the songs with Hans Zimmer as well as Gavin Greenway, R J Lange, Gretchen Peters and others. Quite how the collaborations worked, I have no idea, but it does perhaps make the arrangements more interesting than they might have been. As with Road to El Dorado, Hans Zimmer's score is somewhat abbreviated to make way for Adams' songs, although the indication here is that all of the songs appear in the film whereas many of Elton John's songs were only included on the album. Although his writing for animated films has been generally fine, Zimmer seems a little uninspired here. His ability to pull himself considerably ahead of his Media Ventures colleagues in his above average melodic invention does not seem so in evidence and consequently not a great deal of Spirit stands out. Run Free is a rousing start, but has perhaps a little too much the feeling of a pop instrumental, despite being as playing and adventurous as its title suggests. Also, its simplicity and obvious synthetic components makes it sound more like a demo than even the usual synth heavy Zimmer writing. In fact, the feeling of it being a first draft demo is quite prevalent throughout for some reason, although doesn't impinge on it being fairly enjoyable at the time. Feelings on the album are likely to be coloured by the listener's feelings on Bryan Adams. I am quite impressed that Adams hasn't really dumbed down or softened his style noticeably for what is essentially a kid's adventure film. Having said that, most of the songs aren't that memorable in terms of melody, although the quite complex arrangements make them interesting without sounding too overproduced. I suspect that, as with El Dorado, Zimmer fans will be disappointed with the brevity of his contributions, although they aren't as ambitious as that effort, even if they are almost as enjoyable. I guess not being a great Bryan Adams fan, it's not liable to invite that many repeat listens, although it's a slick, enjoyable, but perhaps a ever so slightly forgettable album.